Posted in: BSU Journal Club. Tagged: astronomy, close-in exoplanets, K2 mission. We had our last research group meeting of 2015 on Friday since finals are coming up soon. Fairly large crowd, though, for a meeting so late in the year. Artist’s conception of Vanderburg’s disintegrating body. From https://www.cfa.harvard.edu/~avanderb/page1.html. We discussed Andrew Vanderburg’s discovery of a disintegrating minor body orbiting a white dwarf star. The body, as small as Ceres or smaller, is so close to its host star that it’s actively evaporating and falling apart, and the shadows of the resulting dust cloud is visible data from the K2 Mission. 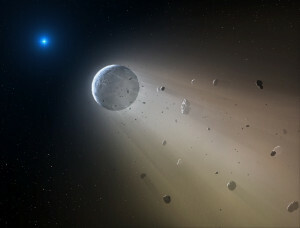 The dust then falls onto the white dwarf, polluting its atmosphere in a way we can see spectrally. We also had a very impressive presentation from Hari Gopalakrishnan of Renaissance High School on a recent study from Jim Fuller at Caltech. Fuller and colleauges analyzed oscillations at the surface of a red giant star to infer the presence and strength of magnetic fields deep in the star’s interior. Hari kindly shared the presentation, which I’ve linked below. Attendees at this journal club included Jennifer Briggs, Karan Davis, Emily Jensen, Tyler Gordon, Steven Kreyche, Jake Soares, and Hari Gopalakrishnan.